Bali, for me at least, conjured up visions of some tropical island paradise. I can't imagine that too many people have not seen South Pacific performed or heard the song Bali Hai (that name has in fact been purloined for a beer). The real Bali is not quite that. Southern Bali-yes there is a north, south and west Bali-is where all of the tourist action is. We spent the first day there in Kuta, the hub of the sidewalk hustlers selling every imaginable trinket. And, they are indeed persistent. After that things settled down. We played golf four times; three at the Bali Golf and Country Club and once at Bali Handara up north. We went touring on two of the other days, spent a couple of days just relaxing at the pool and several other days shopping. Some comments. There is one common denominator in Bali; it's always hot and humid. It's the first thing you notice when you walk outside. I've never been in Miami in mid summer but I guess it's something like that. They also apparently don't have summer here, just day and night. After an hour outside you are planning your next shower. The hotel also had no outside doors anywhere; the hallways were open. I mean you walk out of your room and just walk outside. Or walk to the lobby; it's completely open. I have no idea what it must be like in a real storm. There are a lot of dogs in Bali and, with only a few exceptions, they come from a common gene pool. It's like you are seeing the same dog over and over. Fifteen inches tall, 30 pounds, short hair, curly tail; you know this dog. Similarly, we saw very few cats. However, there are a lot of chickens. ( There may be a connection but I'm not sure what it is.) Now when I say a lot, I mean that dogs, and generally chickens, are on every street everywhere. There are also a lot of scooters. If you can imagine the morning rush hour with dogs and scooters instead of cars on a two lane road you have some idea of what transportation is like. The cars-actually nearly every vehicle was a van or some kind of off-road vehicle-also use their horns a lot to encourage the dogs and scooters to get out of the way. Outside of the major cities, the roads are exactly two cars plus one scooter wide; this was verified over and over again. Furthermore, outside of the big villages, there are almost no stop lights and only a few stop signs. The stop signs were clearly only advisory notices for the transportation guideline in Bali is generally that size gives you the right of way. Dump trucks stop for no one. Our second golf trip was way up in the northern part of the island. It took 2 hours and 15 minutes to drive there and Katherine refused to watch the road for most of the trip. She couldn't believe that we didn't hit, or weren't hit by, something. And that presented us with the major dilemma of the trip. 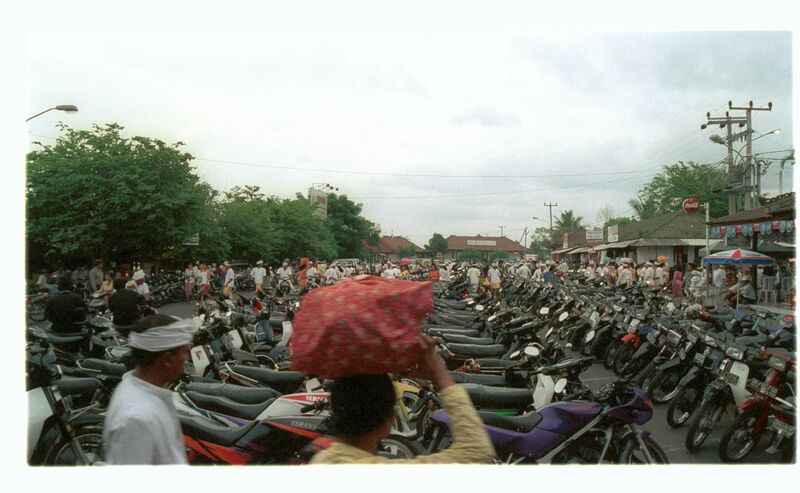 Southern Bali is nearly all tourists. Big five star hotels, the golf course, the big cities or more accurately villages, the popular beaches and so forth. Northern Bali is cooler, beautiful, and significantly less crowded. 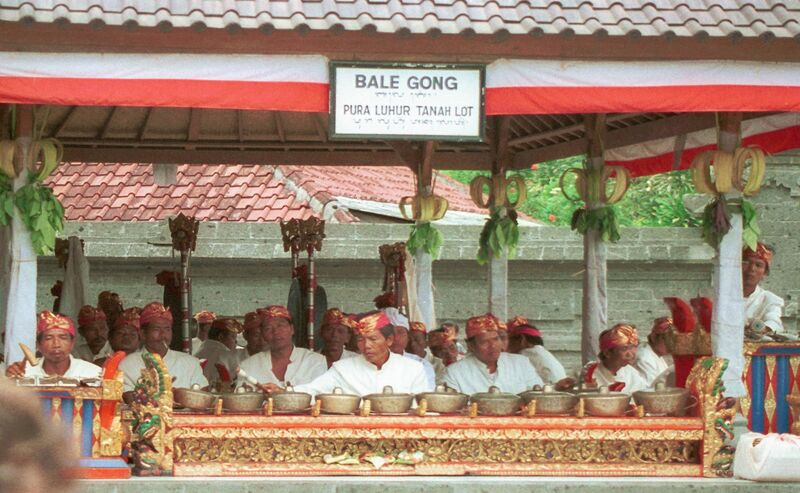 North Bali is the Bali of legend. There are coconut and palm trees, terraced rice paddies going way up the sides of mountains, an active volcano, magnificent mountain scenery viewable from narrow, winding roads and flowering bushes everywhere. The golf course was in a positively beautiful setting. However, the trip was so taxing we both agreed that it was too far to go to play golf and canceled our second visit. On the other sightseeing trip we also went up north to see the volcano. There, we had lunch at one of the most spectacular overlooks we've ever seen. The mountain is at the center of a caldera with a lake off to one side. And, while it's activity now is mostly smoke and steam there are a number of lava flows from activity at various intervals over the last fifty years, the most recent in 1963. And this is all right in front of you. West Bali is a major park that is also supposed to be beautiful but even further away. On the roads you go past innumerable shops selling a variety of products. They are big on furniture and wood carving and they do remarkably good work; they use teak, sandal wood, mahogany, and a variety of other exotic woods. Golf, we found, was expensive at $140 down at Bali G&CC which included the caddies and cart. But just about everything else was cheap. Six months earlier the rupiah was at about 2,000 per dollar. When we were there it had gone to 8,000. So everybody was trying to decide how to price stuff because most of the clientele were tourists. Many places were trying to hold prices to the dollar-e.g. Bali G&CC-but business was very slow and most places were into big time negotiation. 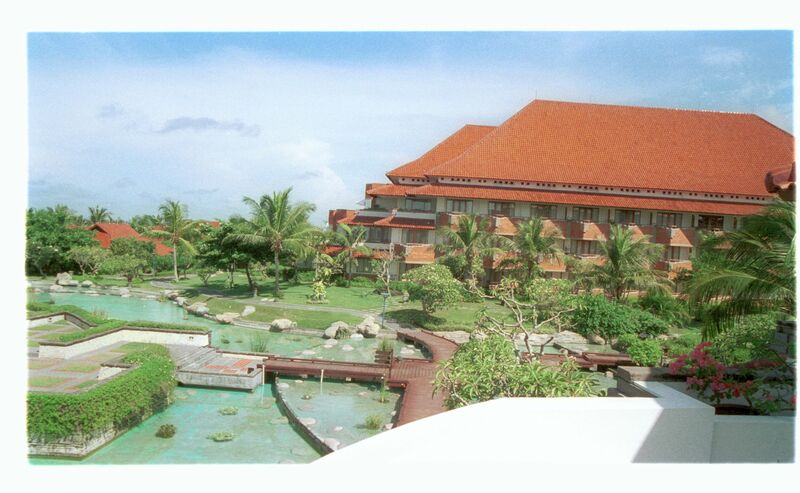 We chose the Bali Cliff Resort-which claimed to be a five star hotel but was more like four stars-because it was away from the tourist areas and quiet. To go into town using a taxi that the hotel called for us cost us 10,000 rupiah. However, to come back cost us 25,000 because no driver liked the drive out. I found myself bargaining with the taxi drivers over 5,000 rupiah because some of them wanted 30,000. But I finally figured out that that worked out to about 70 cents. On this trip for a change, Mike did all the booking using the Internet and faxes. He finally cut a deal for something called the royal suite. We ended up with two bedrooms with TV's, a small kitchen, a living room with a TV, a dining room, a huge master bath plus two other bathrooms, six telephones, and five balconies. (As I said, things were a little slow.) We had an unobstructed view of about 300 degrees and a view of sunrise and sunset as well as the ocean. All for $200 per night. Massages cost $15 for an hour, one of the great luxuries of life. The day after we arrived President Suharto showed up for a one night visit; the unrest had just started so we were not thrilled with this. The other big hotels had clearly superior restaurants and premises but also lacked a lot of charm. And, they also lacked the monkeys. We're down at the pool one morning and there is an obvious commotion among the people by one side of the pool. Seems a group, or is it a bunch or herd or whatever, of moneys is passing through. Katherine zips back up to the room to get some of the fruit there and then tries to hand feed some of them. This they do not like. These were clearly wild monkeys. Anyway, they hung around for a couple of hours and would eat whatever you'd throw to them. The hotel had a dining area on the cliffs above the ocean and here they became real pests. While we were having lunch, one of them covered about 15 feet in several leaps, grabbed a cob of corn off of a stunned Japanese guy's plate and was gone in about three seconds. But it was entertaining. Katherine has always wanted me to try just bumming out; usually we are on some trek be it shopping or whatever. This time just sitting by the pool seemed reasonable; I guess I'm getting old; or is it mature? We figured that we spent more time by the pool in Bali than in the prior 20 years combined. Our evening event consisted of getting to the pool bar before 6 PM, getting some exotic drink-they use fruit juices so they are good for you-and watching the sun set over the ocean. This I quickly got used to. And then there are the Balinese. The people are genuinely friendly. They are all thin but the women are better endowed than the Japanese; at least that is what I was told. The women often wore some stunning outfits. The batik cloth is absolutely beautiful. 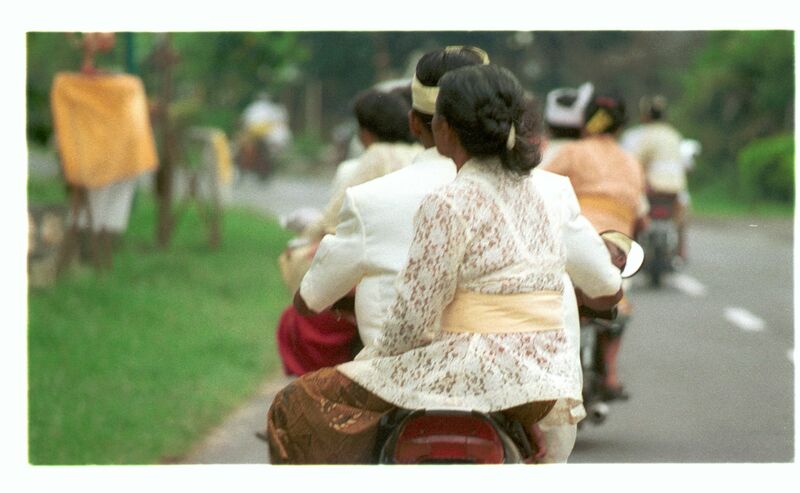 The real contrast was in the morning with the women, beautifully dressed, being driven to work on a scooter riding sidesaddle. And everyone on a scooter wore a helmet unless they were going to the temple. Again, there must be some connection here but I'm not sure what it was. All children wear uniforms to school which makes the morning commute more colorful because each school has a different uniform. Still, a lot of the people are clearly poor and do some really tough work in the rice fields; and life is clearly not going to get better any time soon. But, by and large, we never felt we were around poverty like you see in so many tourist islands. Also, in the 10 days we were there, I think I heard a horn honked in anger only once. They all seem pretty laid back. Balinese music is everywhere but gets real old real fast. There is only so much you can do with gongs, flutes, fiddles, cymbals, drums, rattles and a xylophone kind of instrument. Fortunately, the other often heard music was popular rock and roll. Also, nearly everybody spoke at least a little English so getting around was no problem. However, in all of the travels on the roads I never saw a public toilet. And, of course, you are not supposed to drink the water. We both had some limited difficulties but nothing beyond that. We loved Bali. Few Americans go there because it's a long way away. On the other hand, you see a lot of Aussies because it's fairly close for them. It's one of the few places that we'd go back to given the time.